Looking for How to make a easy, flakey pie crust! (directions, recipe, with photos and free) in 2019? Scroll down this page and follow the links. And if you bring home some fruit or vegetables and want to can, freeze, make jam, salsa or pickles, see this page for simple, reliable, illustrated canning, freezing or preserving directions. There are plenty of other related resources, click on the resources dropdown above. Yes, I know there are ready made pie crusts in the frozen section at the store, but they really are bland and doughy. A flaky crust is easy to make, just follow these simple, illustrated instructions! This recipe is almost identical to the pie pastry shell recipes that you will find in many cookbooks, from Betty Crocker, Better Homes and Gardens to the Amish / Mennonite cookbooks. A few variations and tips from Alto brown and others are included. I'm always open to improvements, so please write if you have any suggestions! 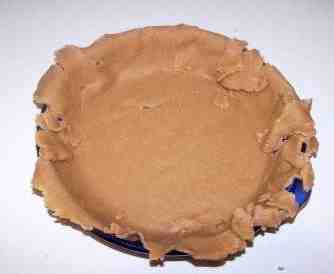 Directions for Making a Flakey Pie Crust - Easily! Yield: makes 1 deep dish 10" pie shell. If you are making a double crust pie (a pie with dough on the top, too), simply double it. 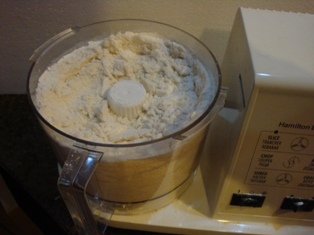 1.5 cups flour (about 6 ounces by weight) - plain flour, not self-rising. I use whole wheat flour, fresh ground at the store while I wait. Mix the flour, sugar and shortening first. About 15 seconds in a food processor is by far the best way, since it is fast and the ingredients don't warm up much. Don't make it too smooth or uniform. Little pea sized granules makes a flaky crust. Note: Alton Brown on the Food Network suggests using 1/6 cup vegetable shortening and 1/3 cup butter (for a total 1/2 cup of both together); because they will melt at different temperatures. It makes a a lighter, flakier crust. 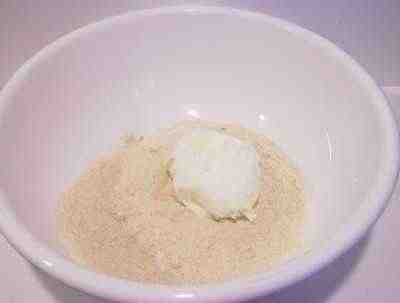 Another key is to keep all the ingredients, especially the butter, shortening and water are very cold. A visitor suggests substituting coconut oil for the Cisco vegetable shortening. She says she used "3 tbs. 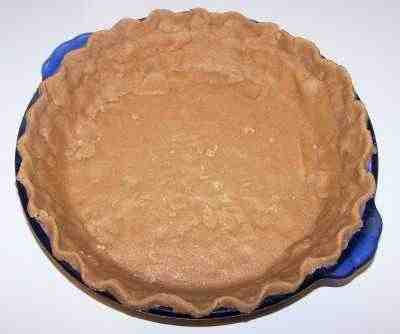 (1/6 c.) coconut oil and 1/3 c. butter and the crust turned out flaky and fabulous!" Then sprinkle in the water, just enough water to make it hold together; a good dough consistency. 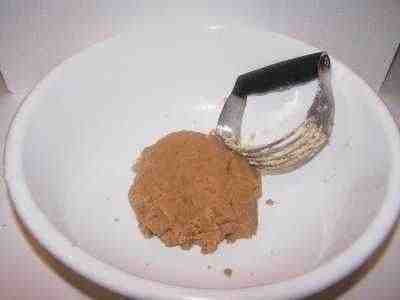 A pastry blender (see photo) works very well to mix, but some people prefer a few seconds in a food processor instead. Just mix it enough to make it into pieces that hold together about the size of a pea. We don't want to overmix it! If you have time, put the dough (wrapped in plastic wrap or a ziploc bag) into the fridge to rest and chill for a half hour or more. If you don't have time, don't worry, just move on to step 3. 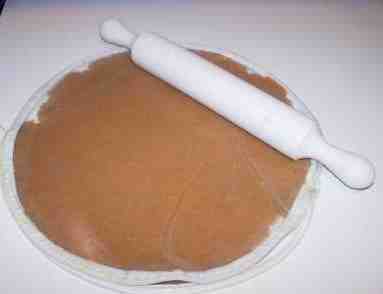 I use a pie crust bag (a circular plastic bag that zips up around the edge, but two pieces of waxed paper will work). 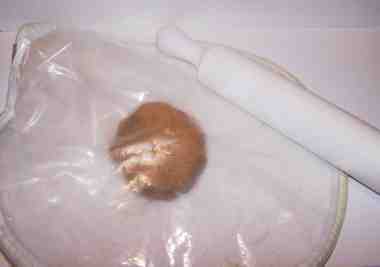 A couple of tablespoons of flour shaken in the bag will help to keep the dough from sticking to the bag. Roll it out to an even thickness, and just an inch or two wider than your pie pan. My crusts are about 1/8 inch thick. Step 4 - Put in the pie pan and shape! Place the dough into the pie pan. Don't worry if it breaks. You can easily fix that. Press the dough into the pan, seal any broken areas, and shape the top edge in any pattern you like; just for appearance's sake. It's now read for you to add the pie ingredients and pop in the oven! And these pie crust shields prevent the crusts from burning. This oven-safe silicone one is some much better than the old aluminum ones (but I have that one, too, if you prefer it.). The pie weights are very useful, too, for prebaked crusts!